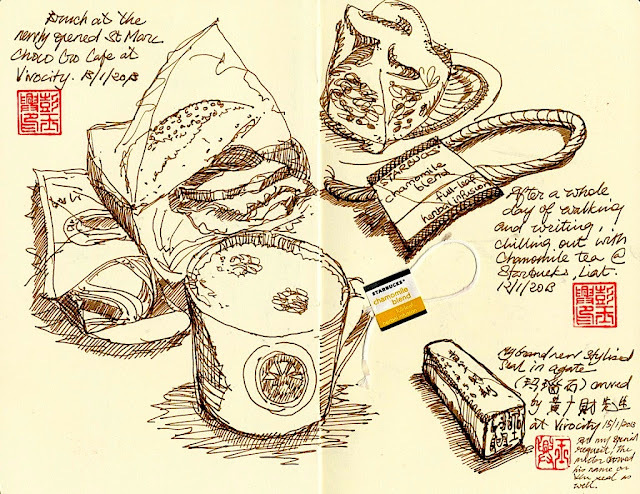 It was a melange of fun at Vivocity on Sunday (clockwise from left cluster): St Marc's Choco Cro, chicken sandwich and latte; Starbucks chamomile from previous sketch; agate seal in stylised Chinese character seal. It was a Sunday for chilling out. I packed my things and went off to Vivocity to try St Marc Cafe and their famous Choco Cro, which is essentially a croissant stuffed with chocolate. Once I got a bite of that crispy-outside-fudgey-inside deliciousness, I melted with the taste. The croissant is a regular piece of golden baked goodness with a generous portion of chocolate goey rolled inside. Do not be fooled though. It is packed with just the right amount of goodness and sweetness, so one is just enough for a good tea or dessert serving to go with that latte you've ordered. It is important to note though: Saint Marc is known more for their desserts than their barista beverages. On the same day, I spotted an ongoing roadshow at Vivocity and saw an actual master craftsman carving seals by hand in the traditional 篆书. I chose an agate seal - a premium material - and got the master to create a stylised seal for me. The result as you can see is the seal on the bottom right of the sketch.